It is accompanied by Stompas Curve pull out desk; 3 drawer chest; and 2 door cube storage unit, offering a practical storage solution as well as a place for them to work and create. The chest offers further storage options for clothes and bedding, whilst the cube unit with two solid oak doors is the ideal spot for keeping toys and games. 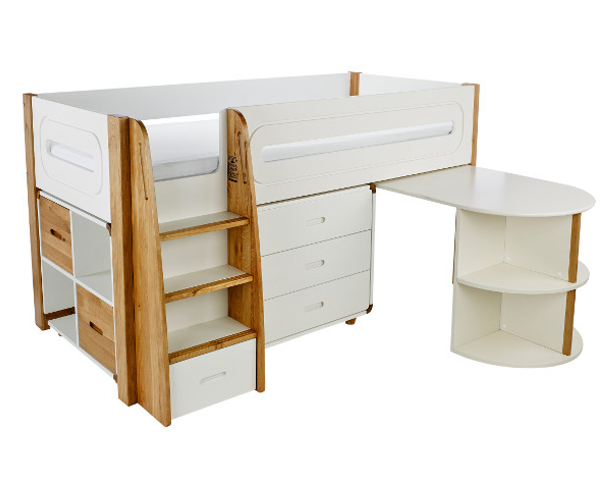 Includes Curve Midsleeper Bed Frame with Pull Out Desk, 3 Drw Chest and Cube Unit with two solid oak doors.